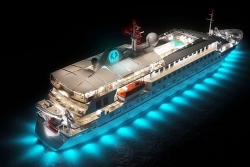 An entirely new class of luxury small ship cruising has been introduced with the launch of the Crystal Esprit. Sleek and nimble, the yacht-like vessel features a shallow draft that allows it to visit secluded harbors, coves and islands that are simply not accessible to larger cruise ships. New itineraries, excursions and activities – all designed with the yacht’s size in mind – enable you to maximize your engagement with the destination in ways not previously possible aboard a ship. 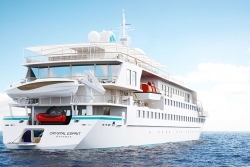 The Crystal Esprit features a variety of watersports equipment that can be used directly from the marina deck aft. Snorkel or swim in the inviting waters of the Adriatic or Seychelles; water ski and jet ski, or paddle a kayak in the early morning quiet. The Esprit’s activity director will help you plan your day on the water or ashore, with a variety of excursions or suggestions for personal discovery. It's time to Begin A New Story, your first class yachting adventure, aboard Crystal Esprit. Our Yacht Guidebook includes detailed information on accommodations, yacht fares, travel requirements and the benefits of booking your travel with a certified travel professional.